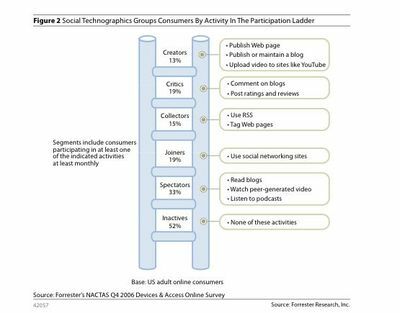 Forrester recently released its Social Technographics report examining participation of the U.S. online population in “social media,” such as reading or publishing blogs, offering online reviews or using social networking sites. Forrester groups people into six categories based on how they participate in today’s Read/Write web. Social Technographics gives us some important clues to what our virtual world strategies need to look like. Although I don’t agree with the “ladder” stratification Forrester uses, – which suggests a hierarchy of more or less significance to a social media activity (they are all equally important) – but the categories are extremely important indicators that marketers should examine and use as a framework for all social media strategies – virtual worlds included. The heavy resident-created content and “early adopter” nature of Second Life may immediately suggest that the social technographics of Second Life residents is significantly weighted toward the “creators” at the very “top” of the Forrester hierarchy. Especially since the technical learning curve is so steep to just get functioning in Second Life, much less getting productive enough to create there. But, don’t confuse technical savvy-ness, with the social networking behaviors of social technographics. Social technographics focuses on the various participative activities a person or “population” engages in. Its true early SL residents rather obviously tend toward “creators” – they collectively, after all, built the SL environment. But, as the population is growing, the social technographics start to look more generalized. Recent Second Life initiatives seem to make some pretty sweeping assumptions about the activities residents will find engaging. But without looking at all the potential activities different types of social media participants are likely to value, it is impossible to create a truly successful presence – or better yet, to offer interesting content across preferred behaviors to engage the largest possible audience. 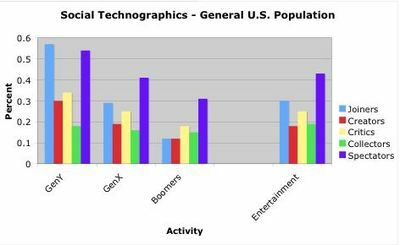 I thought it a valuable exercise, though, to look at Forrester’s Social Technographics through the lens of age distribution in Second Life. I graphed Forrester’s preferred activities percentages by generation; excluding ”Inactives” altogether since by definition they don’t participate in SL. The following shows the graphing results. Because Forrester specially notes that people engaged in social networking activities for entertainment purposes had a little different social technographics profile, I included them as a separate category. We see that GenYers are heavy content Creators, but they are even bigger Joiners, and GenXers and Boomers like lurking and critiquing. Entertainment seekers are also big Joiners and have a tendency to engage in creating, collecting and criticizing relatively equally. Everyone, except GenYers are bigger Spectators. Now let’s look at the generational makeup of Second Life to get a sense of participative activities that might appeal to the SL generations. The graph below is based on Linden Lab’s most recent data of “active” users (1 cumulative hour in last month) and is international. Just for some comparison I also included age information from the First Opinions Panel’s most recent data, which is demographic information from FOP U.S. research panel members. While neither data set allows us to scientifically extrapolate because the data has no valid segmentation, the contrast is pretty interesting in itself – and the trend tells us something that may be unexpected. Looks like we have a bunch of GenX “Spectators” in Second Life. Boomers are very heavily represented in FOP’s data, which is likely a function of their methodology in recruiting panel members – but it should not be discounted as a significant trend. 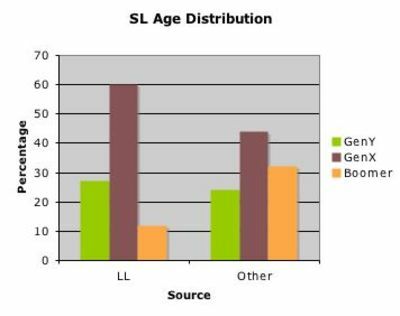 But both data sets do tell us GenX is most heavily represented in SL. There is overlap in preferred activities of the generations – people that do one activity are likely to do at least one or more of the others – so don’t generalize your strategies to something akin to GenXers want to walk around your corporate museum. Spectator doesn’t necessarily mean passive – these people are also enthusastic Joiners. I expect, ethnographically, the social technographics profile of SL may more resemble the Entertainment category, but more research on that is in the works. Virtual worlds offer extremely rich ways to put social technographics intelligence to work. Take the time to give a hard look at the social technographics of who you are most trying to engage, examine the implications for your tactics, and create smart VW strategies that draw into and from the preferred behaviors. More importantly, create virtual worlds strategies and content that support all the activities social networkers engage in, and ways to move among them. You have special opportunities in each activity to provide and to get value. More on the implications of social technographics in creating virtual world strategies in an upcoming post. Stay tuned. A big thanks to Forrester and Charlene Li for providing me a review copy of the report. Originally published at my blog, Business Communicators in Virtuality, 2007.